What's cooler than being a rock star drummer? How about being a rock star drummer with an invisible drum kit! Aerodrums is a musical instrument without the instrument. Instead of reverberating skins stretched over tubes, simply drum on the air in front of you. 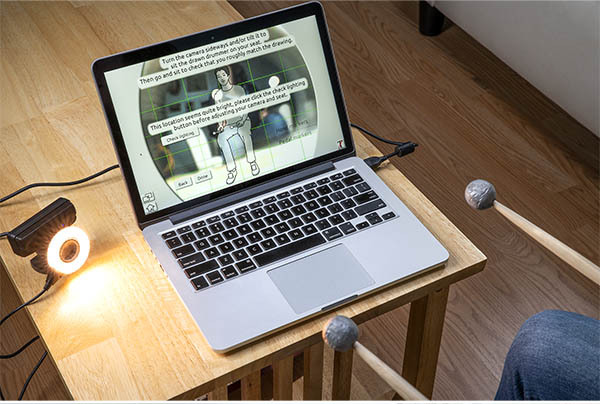 The reflectors on the drumsticks are captured by the included camera and interpreted as drum hits by free software you download on your own computer. 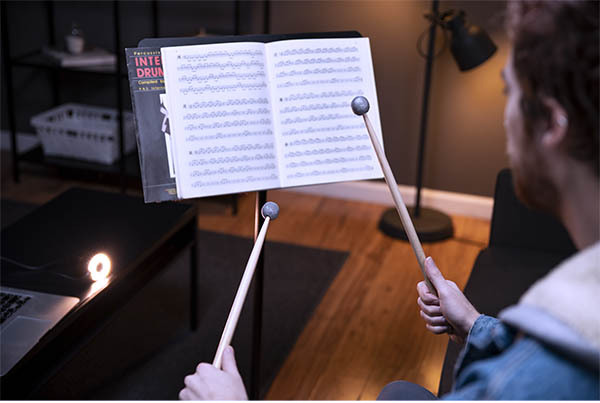 The result is an amazing way to experiment with music that actually creates impressively realistic sounds without requiring a dedicated space for a kit! Aerodrums are the kind of thing that blurs the line between technological innovation and straight-up wizardry. 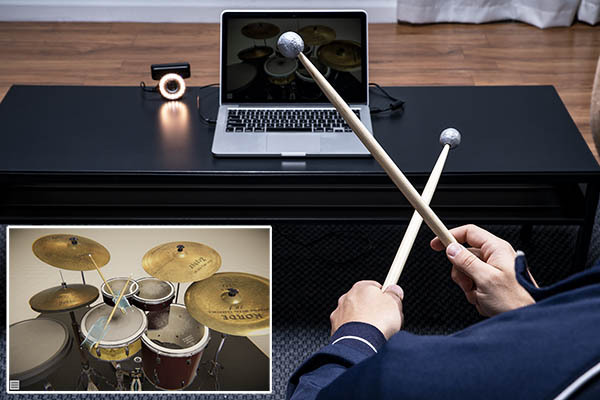 The set allows you to play air drums that actually create sound! 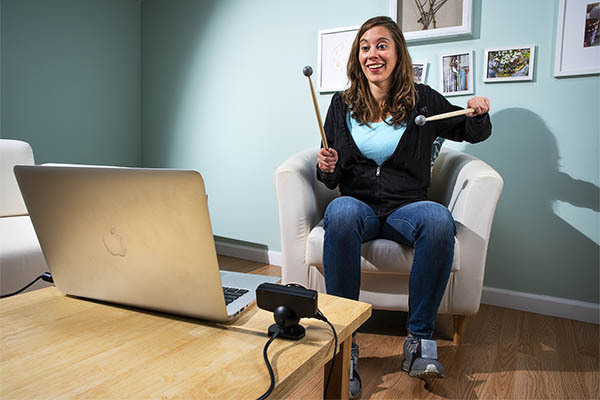 The reflective drumsticks and foot attachments allow a camera to capture your movements and interpret them to make the acoustic resonance of a snare, toms, and cymbals—even though they're nowhere but inside your computer. Aside from the obvious enjoyment of playing air drums for real, Aerodrums allow you to inexpensively practice without annoying the neighbors or requiring a ton of dedicated space for your skins. 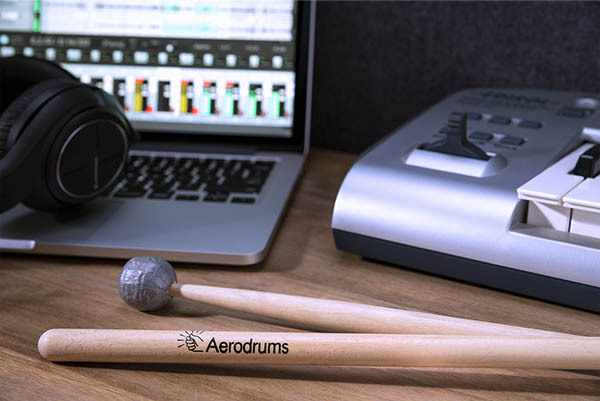 Aerodrums let you make drum sounds without a drum kit! 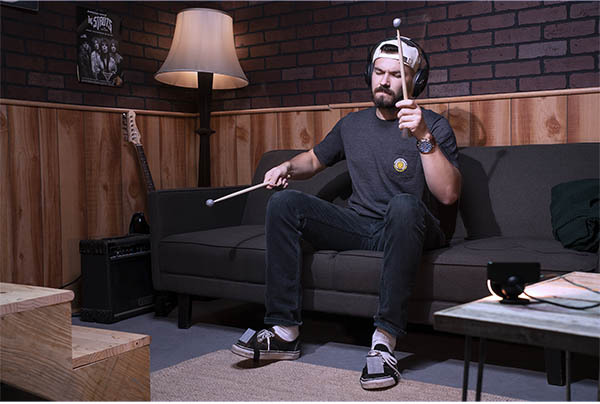 Aerodrums can support your dream of becoming a rockstar from the garage to the studio. Even if you don't yet know how to rouse a crowd with a six-minute solo, pantomiming a killer fill in the air is an enjoyable experience—for you. But as any parent knows, it takes a lot of patience to live with a drummer learning their craft. 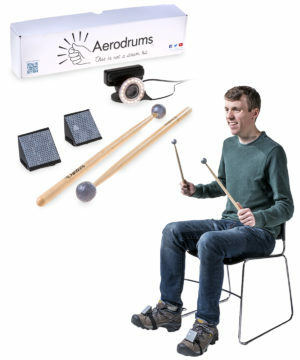 Luckily, Aerodrums empowers burgeoning musicians to practice their paradiddles without bothering anyone else in the house. When you plug earphones into your computer, the drummer is the only one who can hear your four-hour fills. That is, unless you decide to record and share your funky beats with friends. 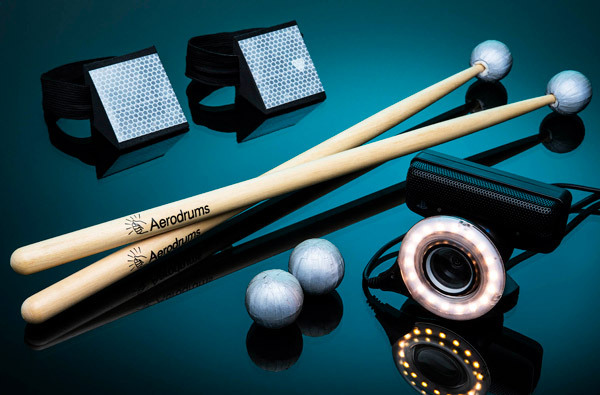 And the winner for the coolest digital instrument is… drumroll, please… Aerodrums, of course! Straddling the real and make-believe, Aerodrums software includes plenty of different options for creating your own custom kit. Select a different sound for each drum in your kit and enjoy the quality samples that even take dynamic range into account to create a realistic result. Setting up Aerodrums is so easy that you can begin to bang out your breakbeat even before someone could set up a conventional kit. Set the camera in front of where you'll be seated and connect it to your computer. 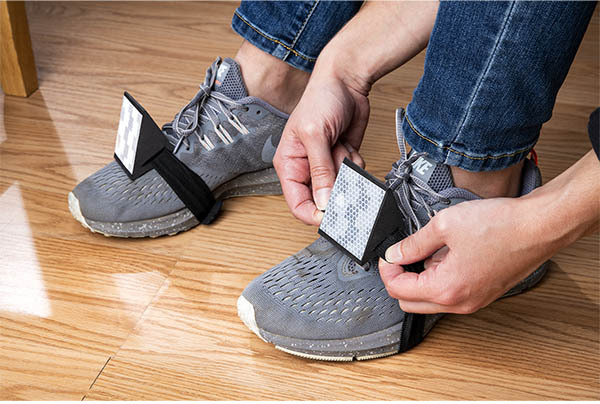 Then attach the foot pedal reflectors to your feet and let the software detect the sensors as you hold the sticks. That's all it takes for you to be ready to rock and roll! Place the camera, attach reflectors, calibrate, and rock out! Part of the charm of Aerodrums is banging away at an invisible kit. But if you want to immerse yourself in a virtual world and see the digital drums you're striking, don a VR headset (sold separately) and live the fantasy rock star life you've always wanted. Play Aerodrums in a VR environment and begin to question reality. Aerodrums comes with seemingly everything but drums. The included camera attaches to the computer you already own (running Windows or MacOS), and the included product code gives you access to download the software that unlocks the potential of the set. Two drumsticks with attached reflectors join forces with dual pedal reflectors to complete the kit. Includes sticks, pedal sensors, replacement tips, setup guide, and software download code (Windows/Mac). Question: How does the sound compare to a real drum set? Answer: The samples used for Aerodrums are incredibly realistic and take your dynamic range into account to deliver lifelike drum hits. 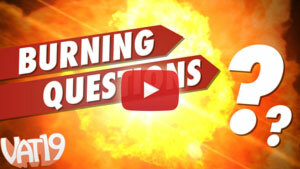 Play the videos on this page to listen for yourself. Question: Do I need anything else to play? Answer: Aside from your hands, feet, and a sense of rhythm, you will need a computer that you can plug the included camera into.